This entry was posted in ACHOA, ACHOA BOD, ACHOA BOD Candidate, ArrowCreek, ArrowCreek 411, ArrowCreek HOA, ArrowCreek411 and tagged ACHOA, ACHOA Board, ACHOA BOD, ACHOA BOD Candidate, ACHOA BOD Candidates, ACHOA Candidate, ArrowCreek, ArrowCreek 411, ArrowCreek411. Bookmark the permalink. 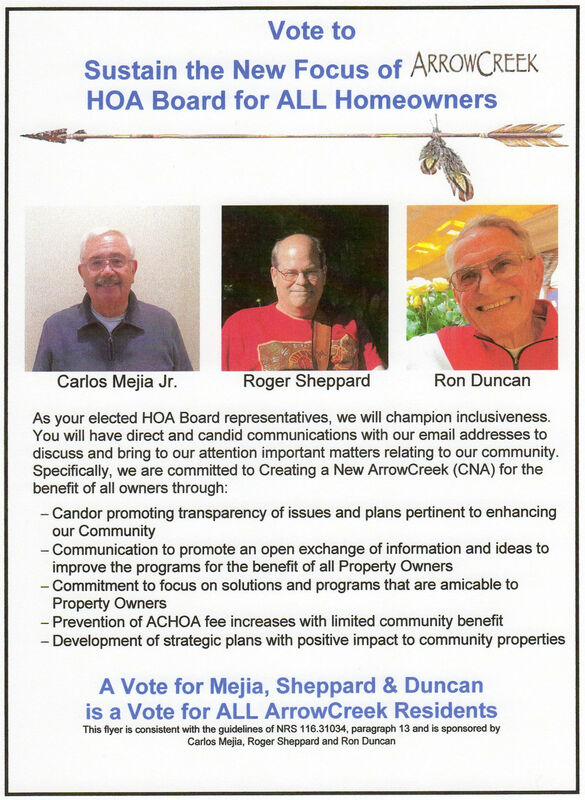 I am disappointed in Mr. Duncan’s and Mr. Sheppard’s statements in their attached flyer. “Commitment on respecting owner feedback to ‘Create a New ArrowCreek’ (CNA) – ‘a Gated Community Enjoyed by All Owners. '” This is a very negative statement about where the community is going and the healing that has started. The current ACHOA Board has stepped out and started to further leverage the financial strength of the Association with the Recent Vendor Hiring – HEC. This process is dynamic and will provide for the first time to the community an Independent Assessment of what this mature diverse community wants and desires. It will provide an excellent framework for future Boards in developing and implementing a Strategic Plan for this Community. The Board Goals are Specific and are challenging but they are looking forward. This is a process that I can support since it looks forward and not back at the original developer plan in 1997.